Welcome to Kenya, or as we say here, Karibu! This is a special ICCM for me. I grew up in Nairobi; in fact our school bus would pass right by the UN every day. So karibu, welcome to this beautiful country (and continent) that has taught me so much about life. Take “Crowdsourcing,” for example. Crowdsourcing is just a new term for the old African saying “It takes a village.” And it took some hard-working villagers to bring us all here. First, my outstanding organizing committee went way, way above and beyond to organize this village gathering. Second, our village of sponsors made it possible for us to invite you all to Nairobi for this Fifth Annual, International Conference of CrisisMappers (ICCM). I see many new faces, which is really super, so by way of introduction, my name is Patrick and I develop free and open source next generation humanitarian technologies with an outstanding team of scientists at the Qatar Computing Research Institute (QCRI), one of this year’s co-sponsors. We’ve already had an exciting two-days of pre-conference site visits with our friends from Sini ni Amani and our co-host Spatial Collective. 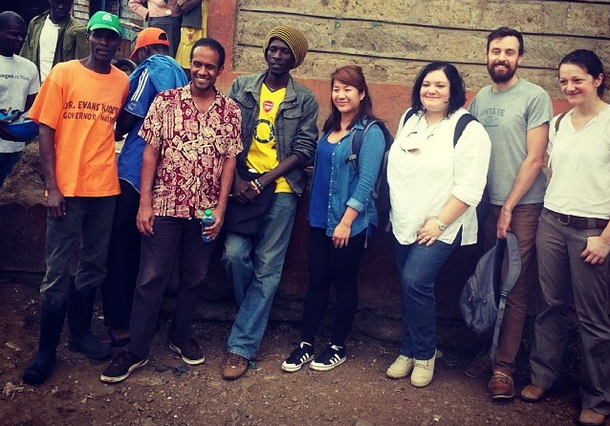 ICCM participants observed first-hand how GIS, mobile technology and communication projects operate in informal settlements, covering a wide range of topics that include governance, civic education and peacebuilding. In addition, our friend Heather Leson from the Open Knowledge Foundation (OKF) coordinated an excellent set of trainings at the iHub yesterday. So a big thank you to Heather, Sisi ni Amani and Spatial Collective for these outstanding pre-conference events. This is my 5th year giving opening remarks at ICCM, so some of you will know from previous years that I often take this moment to reflect on the past 12 months. 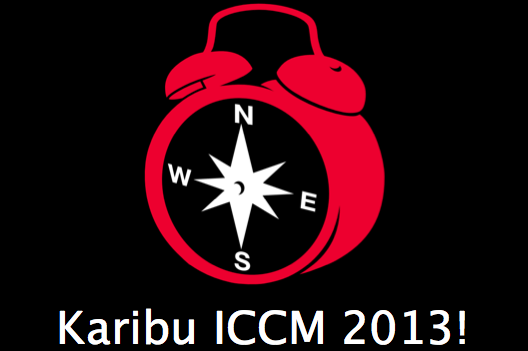 But just reflecting on the past 12 days alone requires it’s own separate ICCM. I’m referring, of course, to the humanitarian and digital humanitarian response to the devastating Typhoon in the Philippines. This response, which is still ongoing, is unparalleled in terms of the level of collaboration between members of the Digital Humanitarian Network (DHN) and formal humanitarian organizations like UN OCHA and WFP. All of these organizations, both formal and digital, are also members of the CrisisMapper Network. 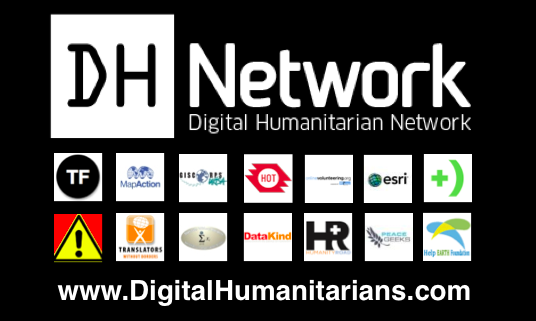 The Digital Humanitarian Network, or DHN, serves as the official interface between formal humanitarian organizations and global networks of tech-savvy digital volunteers. 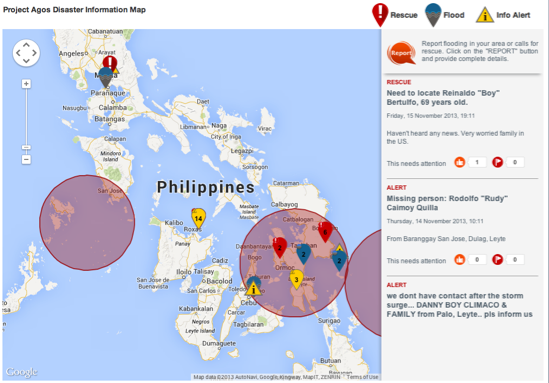 These digital volunteers provide humanitarian organizations with the skill and surge capacity they often need to make timely sense of “Big (Crisis) Data” during major disasters like Typhoon Yolanda. By Big Crisis Data, I mean social media content and satellite imagery, for example. This overflow of information generated during disasters can be as paralyzing to humanitarian response as the absence of information. And making sense of this overflow in response to Yolanda has required all hands on deck—i.e., an unprecedented level of collaboration between many members of the DHN. So I’d like to share with you 2 initial observations from this digital humanitarian response to Yolanda; just 2 points that may be signs of things to come. Local Digital Villages and World Wide (good) Will. 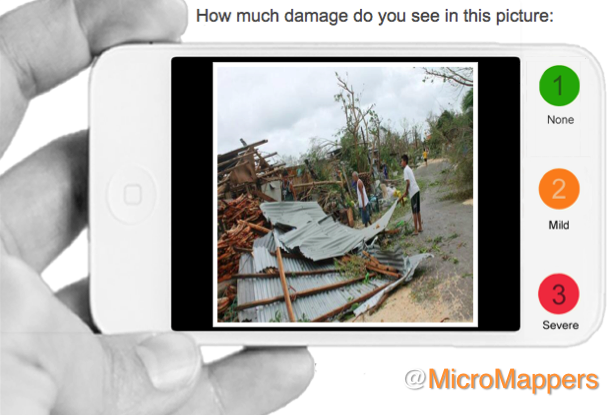 First, there were numerous local digital humanitarians on the ground in the Philippines. These digitally-savvy Filipinos were rapidly self-organizing and launching crisis maps well before any of us outside the Philippines had time to blink. One such group is Rappler, for example. We (the DHN) reached out to them early on, sharing both our data and volunteers. Remember that “Crowdsourcing” is just a new word for the old African saying that “it takes a village…” and sometimes, it takes a digital village to support humanitarian efforts on the ground. And Rappler is hardly the only local digital community that mobilizing in response to Yolanda, there are dozens of digital villages spearheading similar initiatives across the country. The rise of local digital villages means that the distant future (or maybe not too distant future) of humanitarian operations may become less about the formal “brick-and-mortar” humanitarian organizations and, yes, also less about the Digital Humanitarian Network. Disaster response is and has always have been about local communities self-organizing and now local digital communities self-organizing. The majority of lives saved during disasters is attributed to this local agency, not international, external relief. Furthermore, these local digital villages are increasingly the source of humanitarian innovation, so we should pay close attention; we have a lot to learn from these digital villages. Naturally, they too are learning a lot from us. 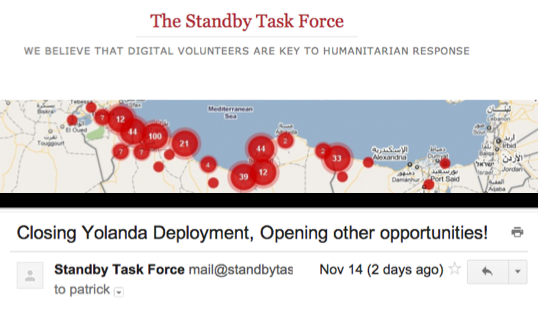 The email provided a list of the most promising ongoing digital volunteer opportunities for the Typhoon response and encouraged volunteers to support whatever efforts they were most drawn to. This second reveals that a “World Wide (good) Will” exists. People care. This is good! Until recently, when disasters struck in faraway lands, we would watch the news on television wishing we could somehow help. That private wish—that innate human emotion—would perhaps translate into a donation. Today, not only can you donate cash to support those affected by disasters, you can also donate a few minutes of your time to support the relief efforts on the ground thanks to new humanitarian technologies and platforms. In other words, you, me, all of us can now translate our private wishes into direct, online public action, which can support those working in disaster-affected areas including local digital villages. This surge of World Wide (good) Will explains why SBTF volunteers wanted to continue volunteering for as long as they wished even if our formal digital humanitarian network had phased out operations. And this is beautiful. We should not seek to limit or control this global goodwill or play the professional versus amateur card too quickly. Besides, who are we kidding? We couldn’t control this flood of goodwill even if we wanted to. But, we can embrace this goodwill and channel it. People care, they want to offer their time to help others thousands of miles away. This is beautiful and the kind of world I want to live in. To paraphrase the philosopher Hannah Arendt, the greatest harm in the world is caused not by evil but apathy. So we should cherish the digital goodwill that springs during disasters. This spring is the digital equivalent of mutual aid, of self-help. The global village of digital Good Samaritans is growing. At the same time, this goodwill, this precious human emotion and the precious time it freely offers can cause more harm than good if it is not channeled responsibly. When international volunteers poor into disaster areas wanting to help, their goodwill can have the opposite effect, especially when they are inexperienced. This is also true of digital volunteers flooding in to help online. We in the CrisisMappers community have the luxury of having learned a lot about digital humanitarian response since the Haiti Earthquake; we have learned important lessons about data privacy and protection, codes of conduct, the critical information needs of humanitarian organizations and disaster-affected populations, standardizing operating procedures, and so on. Indeed we now (for the first time) have data protection protocols that address crowdsourcing, social media and digital volunteers thanks to our colleagues at the ICRC. 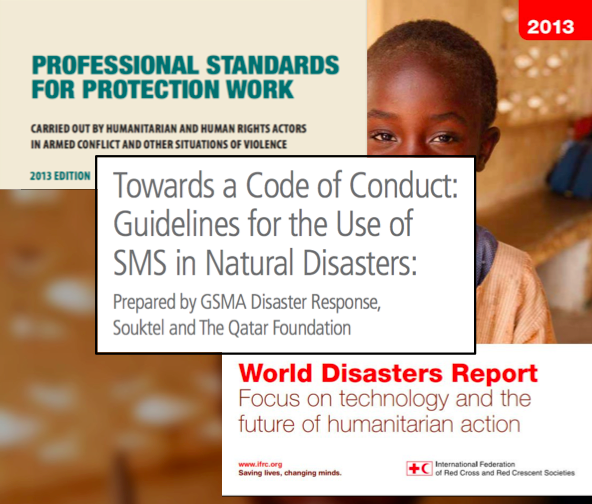 We also have an official code of conduct on the use of SMS for disaster response thanks to our colleagues at GSMA. This year’s World Disaster Report (WDR 2013) also emphasizes the responsible use of next generation humanitarian technologies and the crisis data they manage. Now, this doesn’t mean that we the formal (digital) humanitarian sector have figured it all out—far from it. This simply means that we’ve learned a few important and difficult lessons along the way. Unlike newcomers to the digital humanitarian space, we have the benefit of several years of hard experience to draw on when deploying for disasters like Typhoon Yolanda. While sharing these lessons and disseminating them as widely as possible is obviously a must, it is simply not good enough. Guidebooks and guidelines just won’t cut it. We also need to channel the global spring of digital goodwill and distribute it to avoid “flash floods” of goodwill. So what might these goodwill channels look like? Well they already exist in the form of the Digital Humanitarian Network—more specifically the members of the DHN. These are the channels that focus digital goodwill in support of the humanitarian organizations that physically deploy to disasters. These channels operate using best practices, codes of conduct, protocols, etc., and can be held accountable. At the same time, however, these channels also block the upsurge of goodwill from new digital volunteers—those outside our digital villages. How? Our channels block this World Wide (good) Will by requiring technical expertise to engage with us and/or by requiring an inordinate amount of time commitment. So we should not be surprised if the “World Wide (Good) Will” circumvents our channels altogether, and in so doing causes more harm than good during disasters. Our channels are blocking their engagement and preventing them from joining our digital villages. Clearly we need different channels to focus the World Wide (Good) Will. 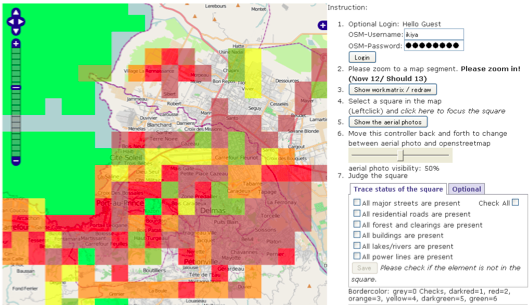 Our friends at Humanitarian OpenStreetMap already figured this out two years ago when they set up their microtasking server, making it easier for less tech-savvy volunteers to engage. We need to democratize our humanitarian technologies to responsibly channel the huge surplus global goodwill that exists online. This explains why my team and I at QCRI are developing MicroMappers and why we deployed the platform in response to OCHA’s request within hours of Typhoon Yolanda making landfall in the Philippines. This digital humanitarian operation was definitely far from perfect, but it was super simple to use and channeled 208 hours of global goodwill in just a matter days. Those are 208 hours that did not cause harm. We had volunteers from dozens of countries around the world and from all ages and walks of life offering their time on MicroMappers. OCHA, which had requested this support, channeled the resulting data to their teams on the ground in the Philippines. These digital volunteers all cared and took the time to try and help others thousands of miles away. The same is true of the remarkable digital volunteers supporting the Humanitarian OpenStreetMap efforts. This is the kind of world I want to live in; the world in which humanitarian technologies harvest the global goodwill and channels it to make a difference to those affected by disasters. So these are two important trends I see moving forward, the rise of well-organized, local digital humanitarian groups, like Rappler, and the rise of World Wide (Good) Will. We must learn from the former, from the local digital villages, and when asked, we should support them as best we can. We should also channel, even amplify the World Wide (Good) Will by democratizing humanitarian technologies and embracing new ways to engage those who want to make a difference. Again, Crowdsourcing is simply a new term for the old African proverb, that it takes a village. Let us not close the doors to that village. So on this note, I thank *you* for participating in ICCM and for being a global village that cares, both on and offline. Big thanks as well to our current team of sponsors for caring about this community and making sure that our village does continue to meet in person every year. And now for the next 3 days, we have an amazing line-up of speakers, panelists & technologies for you. So please use these days to plot, partner and disrupt. And always remember: be tough on ideas, but gentle on people. Thanks again, and keep caring.